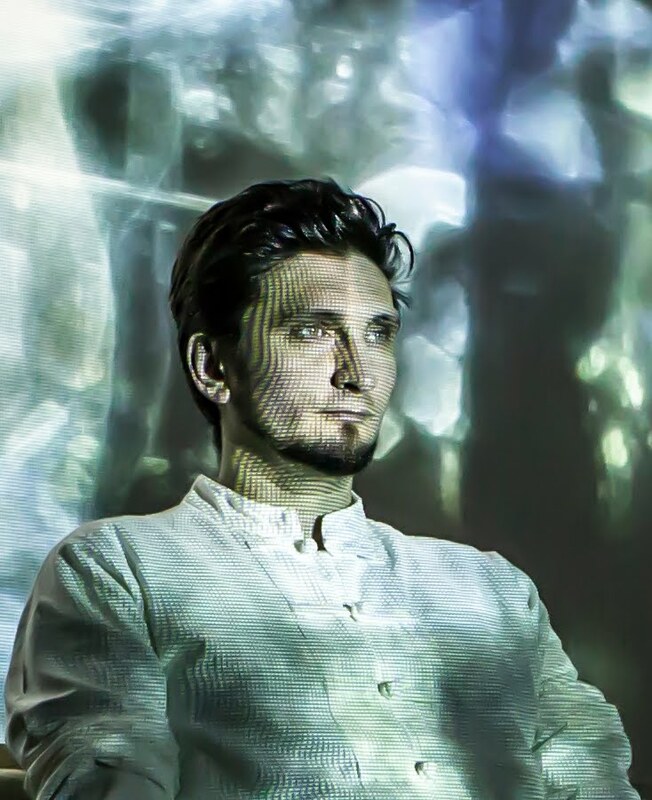 Ever since his debut in 1995, Daniel Dorobanțu has been producing 12 studio albums, multiple video art works, installations, live shows and multimedia experiments. His art gives evidence of a consistent vision on the exploration and search within the undefined. He is motivated by a long-lasting interest and a continuous dissection of the nature of inspiration itself and the contemplative and meditative aspects of the artistic act. The Romanian Cultural Institute and the Ars Electronica Center from Linz commissioned and promoted his works and The New York Times and The Guardian wrote about them. He is generally considered the pioneer of ambient music in Romania. In 1995, Daniel Dorobanțu founded Thy Veils as a personal studio project. Thirteen years later, Daniel shifts his focus from composing to improvisation and transforms Thy Veils into a syncretic art ensemble. As from 2008, no less than 8 artists joined him. Still, the project remained a unique integrative creation and Thy Veils’ concerts became audio-video, immersive event-performances. Thy Veils is a resonant name for the ambient, neoclassic and world-fusion genres, both in the Romanian and international artistic scene. It is the only Romanian band invited at Sziget Music Festival for three consecutive years, between 2014 – 2016. Thy Veils themes gravitate around introspection, contemplative and ecstatic states, as parts of a spiritual journey upheld by the drive to dissolve one’s personal limits. The video art screenings signed by Daniel Dorobanțu not only complement the music, they are an equal part of the performance. Or, sometimes, they are a performance in themselves. A musical-visual wondrous atmosphere, smoothing the passage of the audience towards the inner worlds. In 2010, the digital artwork produced by Daniel Dorobanțu and Michaela Konrad, Memories of Now, became a part of the collection of the Ars Electronica Museum in Linz, the most important electronic art exhibition centre in the world. Daniel Dorobanțu is the first and only Romanian artist with one of his works in this prestigious collection and Memories of Now had been on public display for four years. Also in 2010, he produced the music for the contemporary dance show of the ballet dancer Yin Yue (Shanghai, New York), collaboration which was praised by The New York Times. In 2012, he makes the public video installation Danube Connection: Story & Glory. It is a part of a wide transnational project produced by the Romanian Cultural Institute together with the Association Ivan Patzaichin – Mile 23 in Vienna, Bratislava and Budapest. Among the artist’s recent projects are the cinematic concerts from the “Romanian myths series”. Archaic, primary elements of Romanian mythology and folklore are brought into modernity by means of the latest techniques of audio-video production and large scale presentation. The most recent work from the series, The Silence of Unbounded Space (Liniștea Cuprinsurilor) is a contemporary mythological tale without words. On October 18th, 2015, Daniel Dorobanțu performed for 8 hours without interruption, in front of more than 500 people, attending the performance in the Roman-Catholic Church of Elisabetin from Timișoara. On May 9th, 2016, Daniel Dorobanțu released the “The Silence of Unbounded Space“ album, which was recorded during the live concert. In the DSPro studio from Timișoara, Daniel together with the sound engineer Attila Lukinich carefully translated the live multidimensional sound experience into a studio work intended to carry the listener towards the same wondrous experiences. 2011 – music & sound design for La Soluzione Migliore (Better This Way), Lezard Films Ltd. Nominated by „The Guardian” „among the best artists representative for the new European trends in music” and “for the best music worldwide in November 2010”. Nominated for the music innovation award K-Explora 2003-2004, The Romanian Foundation for Design, Bucharest.